Our likes have been received, Blizzard’s Facebook page has released another pair of images from captivity. As usual, we’ve got a screenshot and a piece of concept art. 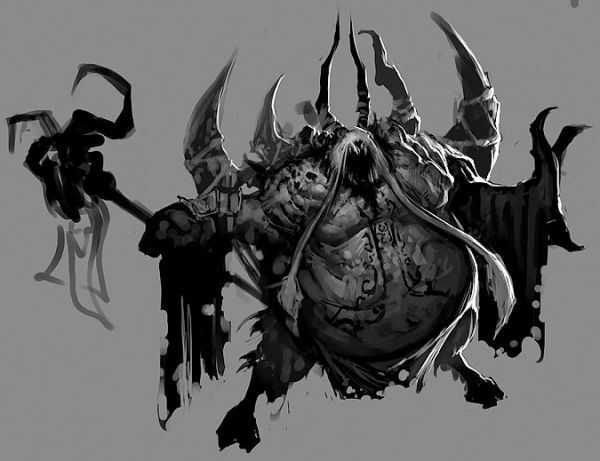 The concept art is mostly new; a closeup of this thing was seen on the original 2008 art reel, and we’ve had that shot in the Monster Gallery ever since, but today’s pic gives us a full view of the hideous creature. Plus, the caption for the shot on Diablo’s FB page sheds a bit more light on the mysterious beast. While this … thing resembles the Khazra, its form is twisted and distorted. It would only be one of many instances where the denizens of Sanctuary have been risen or reformed for demonic purposes. 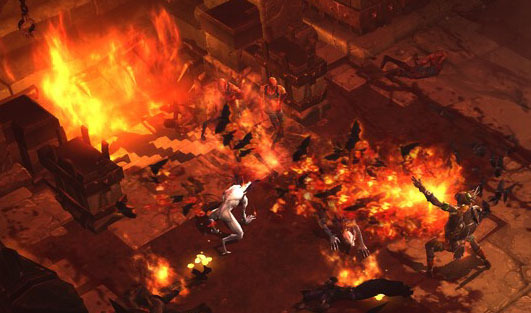 The new screenshot is another view of the fiery torture dungeon we enjoyed so much in the Blizzcon 2010 PvM demo. In this scene (close up below, click it for the full shot) a Witch Doctor is sending a swarm of his Firebats into a fireplace. Firebat heaven? These flaming pits were actually stairways in the demo, up which flaming zombies perpetually came shambling. I didn’t see any way to kill or target the fireplaces; they were just one-way passages from Hell’s kitchen, where all-you-could-eat zombie flambe was always on the menu.